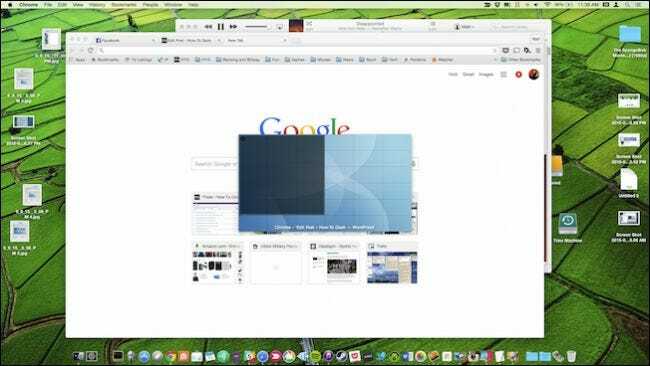 Apple’s recent announcement that the upcoming OS X release (El Capitan or 10.11) will finally, at long last, come with the ability to snap windows to your screen edges. A feature Windows users have enjoyed since 2009. If you’re a Mac user who has no idea what we’re talking about, then let’s review. When Microsoft released Windows 7, it introduced its Snap feature, which lets users simply grab and drag a window to a screen edge and “snap” it there. So for example, if you drag a window to the right edge, it will snap there and resize to half the screen’s width. If you drag it to the top, it will snap there and expand to maximum. Apple has resisted adding this feature, which may not matter much to Mac users who really don’t know what they’re missing, but may feel curiously absent for switchers and people who use both systems. This is set to change with the aforementioned El Capitan release, but for OS X users who can’t upgrade to 10.11, or simply want to have snap powers right now, we want to suggest a solution: Window Tidy. 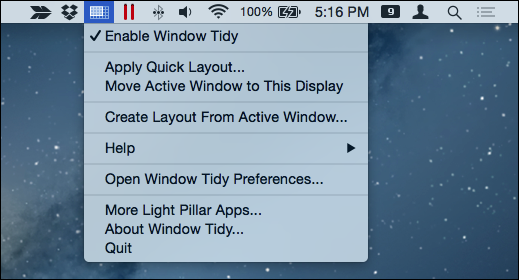 Window Tidy is an app available for download in the Mac App Store. It’s $7.99, which might seem like a lot for something that will be free in the next release but we think that the extra features really make the price a secondary consideration. Especially again, if you’re not on track or not planning on upgrading to El Capitan. Windows Tidy comes with a menu bar icon that provides quick controls as well as access to its preferences. 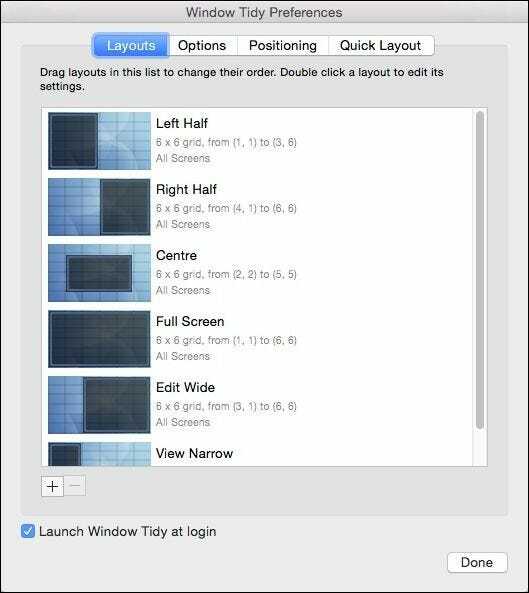 If you want to apply a “Quick Layout” for example, you’re able to draw out where and at what size you want to affect a selected window. You can thus place windows precisely, at a size that isn’t obtrusive but still effective. There’s also an option accessible from the menu bar that lets you move the active window to the current display, but this can already be accomplished using the “Command + #” keyboard shortcuts, which we’ve previously discussed. Snapping with Window Tidy is accomplished by grabbing a window’s title bar. An overlay will then appear and you can drag a window to its desired location and size. If you don’t want this overlay to appear every time you drag a window, you can change its behavior so that it only appears when you grab the title bar and hold the ever-useful “Option” key. This option can be enabled/disabled in the preferences. The Windows Tidy preferences have a lot of power contained within them. Let’s go through each tab and talk briefly about what they do. The first tab let’s you create and order layouts. Take a look at how ours is set up in the preferences and then in the next screenshot, how it looks when we activate the overlay. 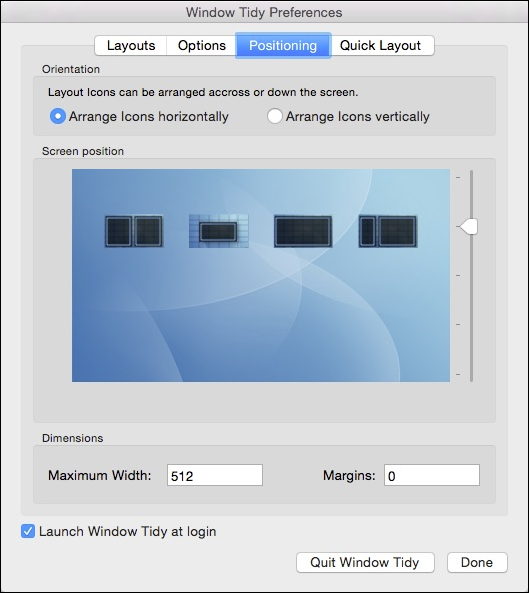 Your overlay will appear as layouts are ordered in the preferences, so make sure that if you want something that will let you snap windows to the right and left edges, that each half is together in the layout order. 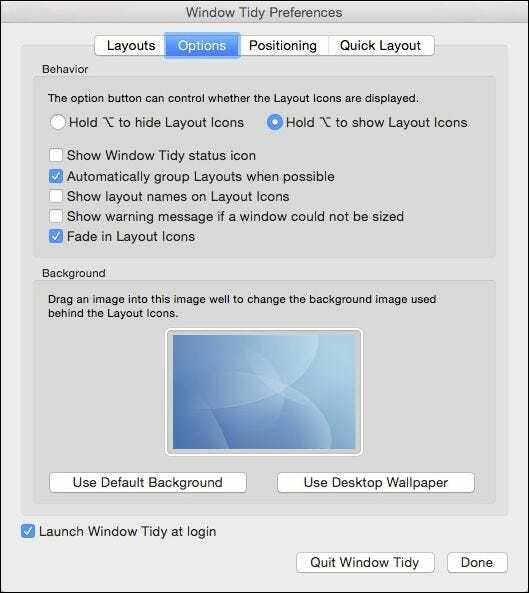 You’re more than likely to spend most of your time in the Window Tidy preferences messing with layouts. Make sure you double-click on each one if you want to really refine its behavior, size, and create a quick activation shortcut. This is the kind of fine-grained control that adds considerable value to the app. All of our Activation Shortcuts closely resemble their Windows counterparts. In this example, “Command + Shift + Left” will pin a window to the left screen edge. Next, the “Options” tab has many very useful items that you’re going to want to go through. Most of them are pretty self-explanatory. 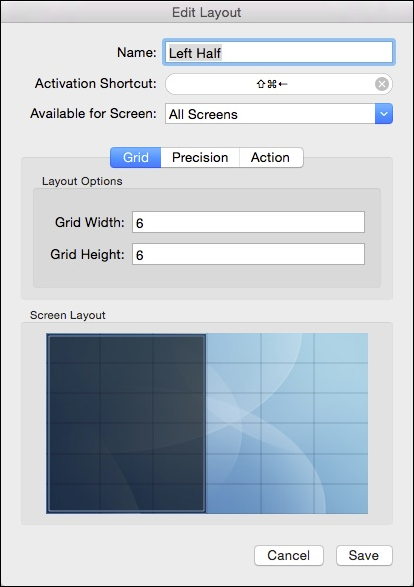 Make sure you note that this is where you can enable/disable the “Option” button for the screen layout overlay. With the “Positioning” tab, you can elect to arrange the layout icons horizontally or vertically, as well where they appear on the screen. Positioning is also something you will want to pay special attention to because where the layout overlay appears may not be ideal for you. Finally, there’s a tab devoted solely to the “Quick Layout” feature we discussed earlier. 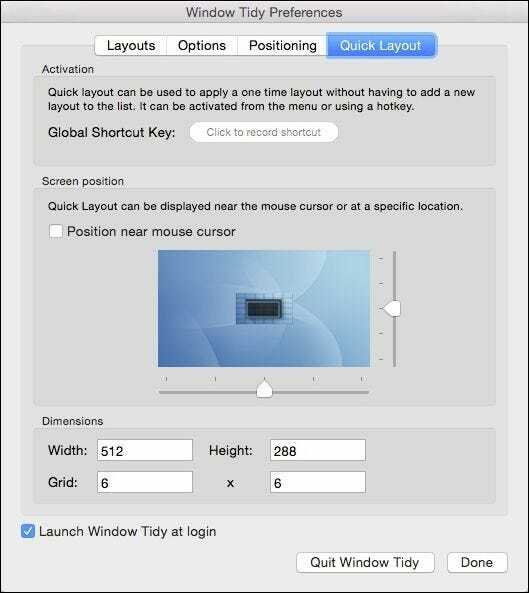 Here we can assign a global shortcut key so you can access Quick Layouts without using the menu bar icon; change the Quick Layout overlay’s size and location; and alter its dimensions. If you get hooked on Quick Layouts, you will definitely want to spend some time here figuring out what works best for you. Regardless of whether you are a diehard Mac user, a longtime Windows user, or someone who jumps between the two operating systems on a regular basis, windows snapping is definitely a very useful feature. 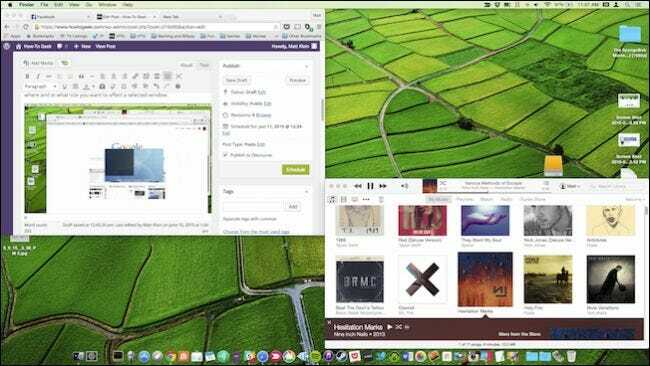 No doubt the snap features that are being rolled out in the upcoming OS X release will be warmly received and widely used, but if you want this feature now, or you really want something that’s going to give you an almost extreme amount of control over the experience, then we recommend you consider Window Tidy for OS X. Let us know what you think. 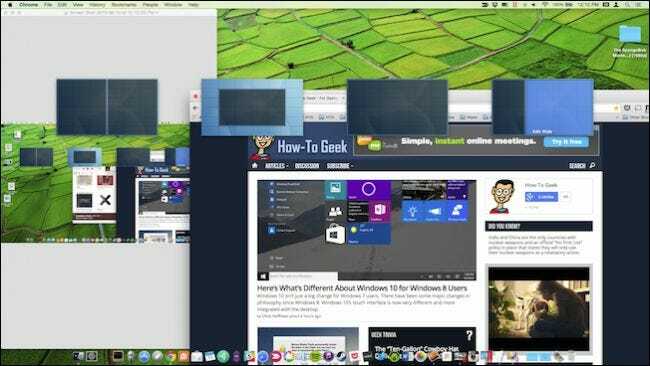 Do you as a Mac user find the idea of snapping windows useful or is it just ho-hum? Sound off in our discussion forum with your questions and comments.